Note: This is the 200th installment of my Episode Spotlight feature. That means I have 51 more episodes to review and should wrap things up in October 2017. The very first episode I reviewed was “Major Ego” back in January 2013. Capsule Summary: Hawkeye and Trapper worry about Radar, who is down in the dumps, and eventually learn he received a Dear John recording. They try to set him up with a pretty, intelligent nurse recently transferred to the 4077th. Ah, the famous “Ah, Bach” episode. To be honest, I don’t consider it a great episode. I don’t think either of the storylines are particularly strong. Radar’s A story takes forever to get going and even after Lt. Anderson arrives it never really picks up much steam. The B story involving Margaret and Frank is silly at best, dumb at worst. Hawkeye and Trapper trying to teach Radar to act sophisticated is amusing but also cruel. Their goal is to heal Radar’s broken heart by setting him up with a nurse. Do they really think they’re helping him by pushing him toward Lt. Anderson? That teaching him a few phrases and telling him to look bored will impress her? It’s ridiculous. Curiously, none of the women at the 4077th wanting to date Radar is the reverse of “Edwina” in which none of the men want to date a klutzy nurse. Radar falling for a sophisticated nurse is later revisited in “Springtime” during Season 3 only he has better luck. I don’t know what to say about the B story. Margaret and Frank trying to sneak away for some quality private time only to be kept apart by Hawkeye and Trapper isn’t really a storyline. It’s not funny and it’s not believable. Supposedly, Hawkeye, Trapper, and Radar are able to keep them apart for weeks. That doesn’t seem realistic. Fans have speculated about who provided the voices for Linda Sue and Elroy Fimple. Mary Kay Place has been put forward as the voice of Linda Sue. However, Larry Gelbart stated in a June 2003 post to the alt.tv.mash Usenet group that Mary Kay Place was not the voice of Linda Sue. Unfortunately, he couldn’t recall who did voice her. As for Elroy Fimple, some fans think actor Dennis Fimple (who guest starred in “Tuttle” as Sparky) provided his voice. I don’t believe there has been confirmation one way or the other. When Hawkeye, Trapper, and Radar are eating lunch with Lt. Anderson, the edge of the tent can be seen in the upper left, revealing the scene was filmed on the Stage 9 sound stage. If I recall correctly, the shot of Colonel Blake catching his finger on one of the fishhooks on his hate was heavily featured in promotional spots for M*A*S*H on FX in the late 1990s or early 2000s. Barbara Brownell made her second and last appearance on M*A*S*H in this episode. She previously guest starred in “The Moose” playing the same character (Lt. Jones). Indira Danks, who played Lt. O’Brien in this episode, is better known as Stefanianna Christopherson and was the original voice of Daphne during the first season of Scooby Doo, Where Are You! I believe Sheila Lauritsen can be seen sitting in the Mess Tent in the tag scene when Lt. Anderson is boring Radar with talk about musicians being subsidized by wealthy patrons. 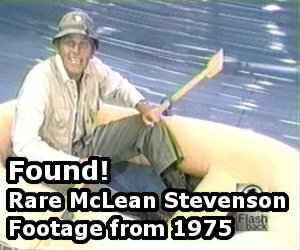 Klinger and Father Mulcahy do not appear in this episode, although Father Mulcahy is mentioned. I pretty much agree that this isn’t a very strong episode. Memorable, yes, but not strong. This is the common mentality among many people though, that when someone breaks your heart, the cure is to immediately find somebody else to take your mind off your heartbreaker, but that only makes things worse because you don’t have time to grieve and heal. 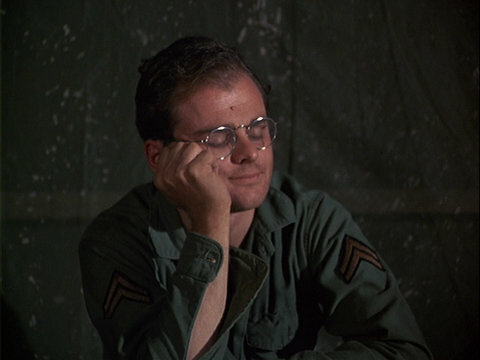 That being said, Lt. Anderson was way out of Radar’s league. Sure, she was easy on the eyes, but honestly, she was just way too sophisticated, well-read, and cultured for a simple farm boy like Radar – that surely wouldn’t last. So again, my feeling is that this episode is memorable, just not great. Honestly, I believe this to be an entertaining episode. Although, I have an issue with Lt. Anderson’s arrival in camp. When Margaret greets the jeep, she failed to distinguish which nurse she wanted to come with her by name. Frank: Probably has only one thing on her mind. Margaret: Don’t say that word, Frank. Not at lunch. Interestingly, the first episode of what I call the “Valentine’s quadrilogy” is maybe the best of the four. In case anyone is curious, a quadrilogy is an extension of a trilogy. I take it the other three episodes would be “Springtime,” “Hot Lips is Back in Town,” and “Good-bye, Radar Part 1”? Actually, the other three are “Margaret’s Engagement”, “Margaret’s Marriage”, and “Ain’t Love Grand”. But the ones you mentioned are also worthy of inclusion. Thanks for replying. Hawkeye: Well, Tolstoy was flexible. He went either way. Ah. Because the focus of this episode is Radar and a nurse, I ended up honing in on that, since Radar seemed to develop a crush on a nurse three other times, lol. Y’know, all things considered, there are other episodes that could qualify as “Valentine’s episodes” as well: “Henry in Love,” “Hanky Panky,” “Love and War,” “War Co-Respondant.” Maybe “The Party” by proxy, considering Valentine’s Day is actually referenced in that episode (if only as the proposed date for the stateside reunion). One thing I noticed wasn’t mentioned here is that this is one of those early episodes before they nailed all the characters down, and before the character of Radar changed. The fact that he has a fiance back in the states is almost completely against the character we see for the vast majority of the show where he’s very virginal and scared of all women. Not to mention that the girl back home calls him Radar. I highly doubt his girlfriend would call him that. But I could be wrong. Just seems strange. Regarding Margaret’s ultimatum about Radar and Lt. Anderson’s coupling, I want to know what Gen. Clayton would’ve done if Margaret called him about the O’Reilly-Anderson situation. The last scene before the tag in Margaret’s tent raises my dander, especially Hawkeye and Trapper telling Burnslihan to lay off Radar and Louise, leading Burnslihan to claim they were being blackmailed. All in all, a fun episode. The scene in Henry’s office when Margaret voices her disdain for Radar’s relationship is emblematic of her hypocrisy. Hawkeye: Without love, what are we worth? 89 cents, 89 cents worth of chemicals wandering this world lonely. Another example of the outstanding writing on the show.